There’s no doubt about it: modeling takes hard work, practice, and preparation! When we see picture-perfect models strutting down the runway, it’s important to know it’s the result of weeks, months, even years of getting to that point. We all know that a lack of sleep is tough on the body, and before long, it takes a great toll on your health and your appearance. You can usually tell by looking at someone if they’re sleep deprived, so it’s important that runway models are very well-rested before a runway show so they look their best. Not only is it important to get a lot of sleep before models take to the catwalk, but it’s also critical to be well-rested before photo shoots or any other kind of modeling job. Before a runway show, models try to make sure they aren’t bloated and are feeling energetic and healthy. A well-rounded diet is a must for models, and they often kick up their healthy eating leading up to a fashion show. Although many models admit they stick to a healthy diet most of the time, Victoria’s Secret Angel Lily Aldridge shared that she eats a lot of salmon and vegetables before a show to look and feel her best. On the other hand, Angel Candace Swanepoel admits she eats a lot of steak and mashed potatoes before a show to keep her weight where she wants it and not be too small. Along with a healthy diet, it’s very important that you are in great shape before a show. Male supermodel Tyson Beckford’s workout routine before a show can be pretty intense. He’ll do up to 600 sit-ups and 1000 push-ups a day before a show, along with a lot of cardio. While supermodels are admired for their “perfect form,” they certainly work hard to achieve and maintain them! After all, a big part of their job is looking good! Part of a healthy diet includes staying hydrated. Not only will increasing your fluid intake make your skin look better, but drinking water will also speed up metabolism. 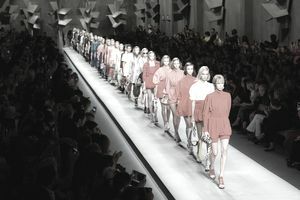 Professional models know that being super hydrated before they walk the runway is critical in preventing dizziness and even fainting caused by dehydration, which can be disastrous. Being a runway model takes more than just looking beautiful for a few minutes on the runway. You will experience multiple fittings, rehearsals, hair, and makeup sessions, and more—all of which means you will be pushed and pulled in a multitude of directions. Having patience, and finding your own happy place inside your head, while the fashion show chaos swirls around you, is essential not only for a healthy body but also a healthy state of mind.